We publisched this review when Eric Briffard was still working at "Le Cinq". He's not sharing his art any longer with the public, but is teaching at Cordon Bleu. I will never forget a long discussion I once had with two artists from New York, a lot of wine involved, at my dinner table in Paris. It was about genius versus craftsmanship and both of my friends, a couple in fact, took opposite sides: she (a painter) was forcefully arguing for the sparkle of ideas, the wink of creation, the fever of inspiration. He (a sculptor) was the advocate of skills, of training, of education, of hard work. 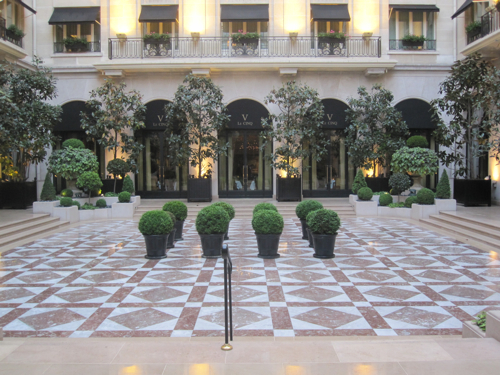 Today, I would like to have dinner with them again, at Eric Briffard’s "Le Cinq" in hotel George V – just to show them that they were both absolutely right. Briffard has it all: his teacher was the grand master chef Joel Robuchon, he has worked with the other French cooking mandarin Alain Ducasse at Plaza Athenée, he is an MOF, a "meilleur ouvrier de France" hence he is an excellent, hard-working craftsman. That alone wouldn’t explain the magic of his cooking though, the stunning art of his food presentation and the overall sensation that he is able to deliver. Which only means that Briffard is blessed with genius too, he has obviously been kissed by some sort of culinary angels, giving him the perfect combination. The sometimes enigmatic Michelin guide hasn’t come up with the third star yet and only God knows why. Its criteria are more than fulfilled: you’re dining in a splendid, beautifully decorated, well-lit "salle" as big as a ballroom. Tables are set as they should be, the china is exquisite as is the cutlery, service is perfect. So you’re charmed even before dinner begins. The main courses were equally convincing and the one I had produced a rare moment of perfect pleasure. 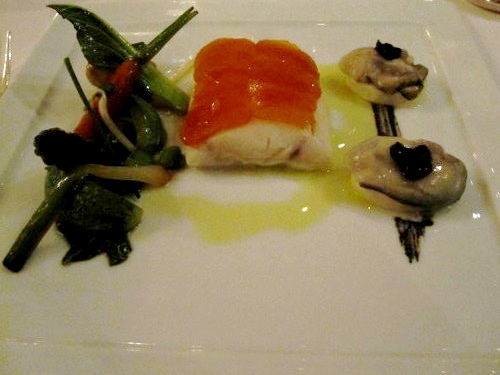 Briffard & Co. had prepared a generous slice of seabass, covered with a layer of bottarga (the roe pouch of grey mullet) accompanied by two oysters sitting on a bed of tofu and assorted pan-fried greens. Sounds weird? I’d say so. But in the mouth, on the palate, everything felt just right, everything fell into place – kicking off sensations and emotions normally linked to the consumption of illegal drugs. The sad thing is that life is too short and money too scarce to taste everything Briffard and his team have to offer. 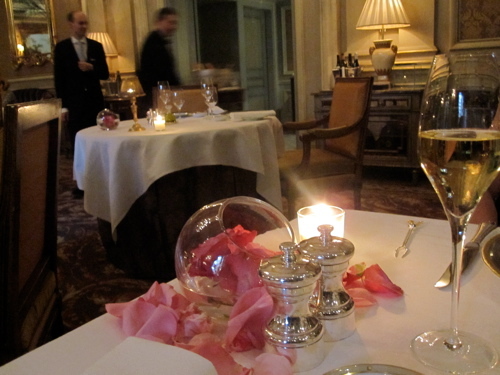 The menu consists of everything you would expect in a grand Parisian restaurant. Turbot and bass, pigeons and lamb, rabbit and poultry from the Bresse region. Needless to say that the pâtissier is another hard-working genius in the squad. The desserts at "Le Cinq" are quite sensational, we had a piece of art made of meringue and fraises de bois, and strawberries stuffed with fancy creams and sweet stuff, excellent. Overall, everything we ate fell in the category "don’t try this at home" (because you’ll never come close). 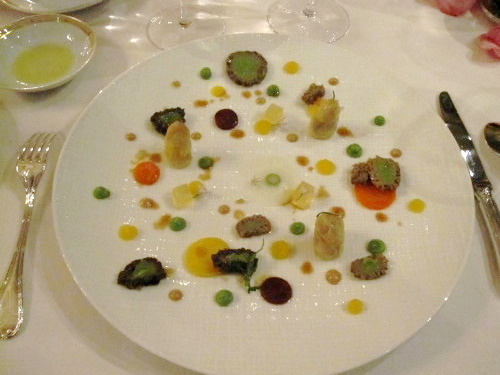 And that’s what you expect when paying 600 Euros (850 US$) for a dinner for two, don’t you? It’s absurd? Decadent? Obscene? Of course it is. But look at it this way: life is short. 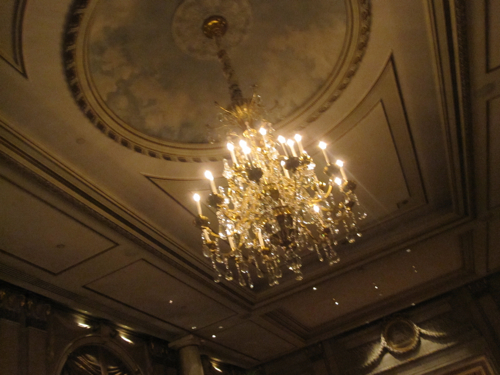 So it might be better to dine at "Le Cinq" than to buy a new DVD player, don’t you think? And it’s your chance to become a generous patron of a very skilled and hard-working artist, blessed with genius, passion, love. His name is Eric Briffard. And if you love food, you should consider a pilgrimage to his temple.